How is the weather where you are and how is your January shaping up? As we dive into January, Alabama is experiencing some unusually cold temperatures. I had to dig out that one pair of boots and the “real” gloves that I have an opportunity to wear once in a blue-with-pink-polka-dots moon and have so far managed to only leave my house once this week. I have one more time I have to leave and other than that will keep working away right here inside my cozy four walls wherein everything I need in this world resides, contented as a cat. Now that we’re at the start of another year, resolutions are being tossed about hither and yon at every turn. When I was younger, I used to look at a new year as a blank slate to begin again. But at this point in my life, I feel like I’m in the middle of my story and I’d just as soon keep moving forward and see these chapters unfold as to start another one. God has been working on me a while and square one is not where I’d like to be again! This year holds it’s challenges, some greater than others, a few seeming almost insurmountable, but it will also hold it’s memories, joy, and lessons learned as well. I’ve already decided to be grateful for the whole lot. I’m also grateful to have you here to share my blessings with, so thank you. I hope to bring you many more delicious meals in the coming year! This recipe is a new one I worked up a month or so ago. 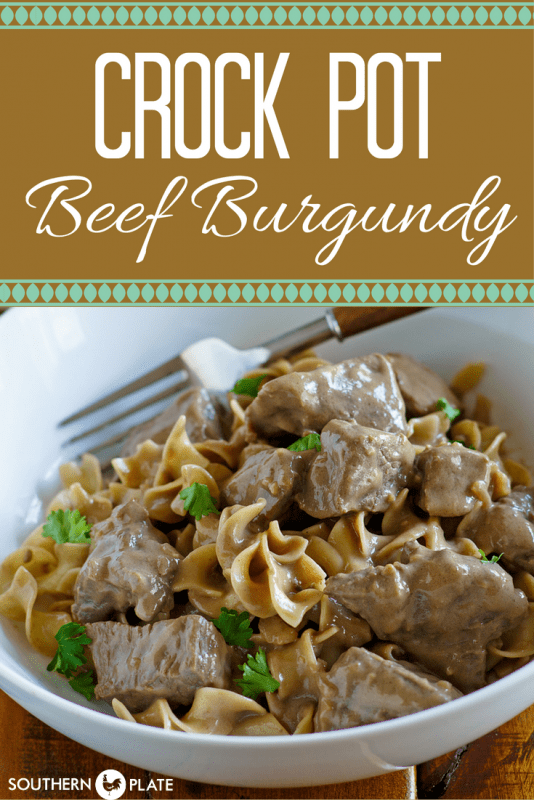 Ricky loves Beef Burgundy and I’m always looking for a new flavor twist for beef cooked in a crock pot. Being teetotalers, I finally came up with a good substitute for wine that really mimics the flavor and tenderizing effect in a beef dish. It’s difficult not to lick our plates when this delectable sauce is present so I recommend serving this with some sort of bread that you can mop the remaining sauce up with. 😉 It’s a dump and go recipe, simple and easy, so make sure you don’t blink or you’ll miss it! These ingredients are simple and quick. 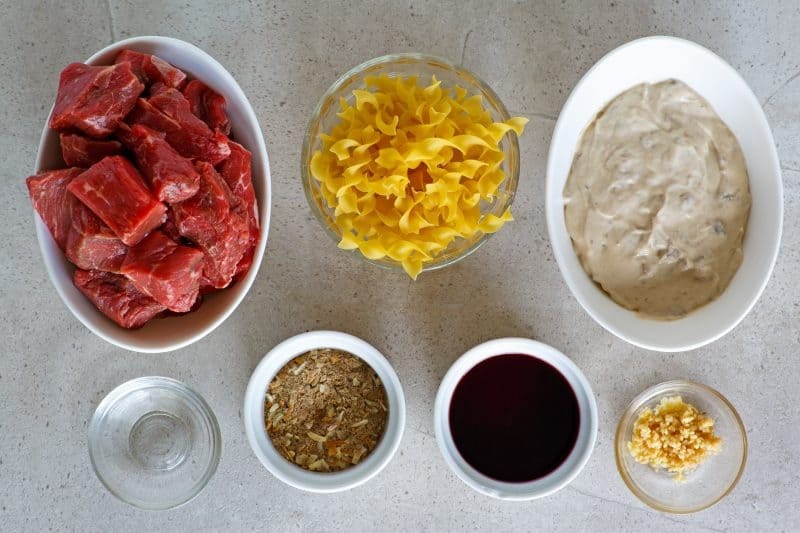 Stew Meat, Egg Noodles (for serving, rice works as well), Cream of Mushroom Soup*, White Vinegar, Onion Soup Mix, Grape Juice, and Minced Garlic. *You can get my recipe for homemade Cream of Mushroom soup by clicking here or just use a can as I am doing in this post. The grape juice mixed with a smidge of white vinegar serves as an excellent stand in for wine in this recipe and really gives the sauce a delicious depth of flavor, making all the difference! If you don’t normally drink grape juice in your house, you can freeze the rest of it in an ice cube tray and then pop the cube into a zipper bag to store in your freezer until you want to make this recipe again. Place all sauce ingredients in a medium sized bowl or small sauce pot and heat. •If you’re using a bowl you can just put this in the microwave for 1-2 minutes. After it is heated stir well until well blended. •If using a sauce pot you an heat it over medium heat, stirring often, until well blended. 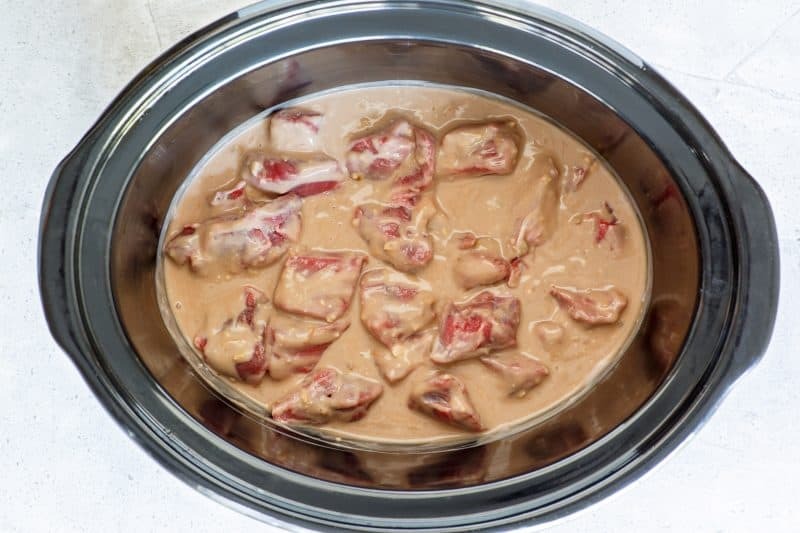 Place beef tips in bottom of slow cooker. Pour sauce over. Cook on low, 7-8 hours or high, 3-4. Serve over freshly cooked egg noodles, rice, or mashed potatoes, spooning extra sauce on top. This meal will warm you up and get your taste buds dancing! It’s become one of the meals my husband and I look forward to most and I sure hope you get to try it soon. Place stew meat in bottom of slow cooker. In medium size bowl, combine all other ingredients. Microwave for about a minute or so, stir well to blend, pour over meat. Cook on low all day, 7-8 hours, or on high 3-4 hours. Server over freshly cooked egg noodles, rice, or mashed potatoes. Thanks Christy. This looks so yummy. I love it any time I can make a tender beef dish. And I get to smell it simmering in the crock pot? Bonus! I too am holed up in this cold weather. Today it got up to 35 and we thought it was a heat wave! Keep warm! Heat wave indeed!! I hope you are able to keep warm as well Chrissy!! Would this be okay to cook and freeze for a later time of course other than the noodles or rice? I sent you an email christy asking about cooked meals to make up in advance and freeze. I LOVED that show…those two old “broads” were a hoot! Learned a lot from them, too. be compared with grape juice? Thanks for sharing another one of your great tips Barbara!!! This looks so yummy, I want to try it ASAP! My slow cooker died after many years of faithful service, so I’ve got to get a new one. I know you have many that you use, can you recommend a good one for me? There are so many on the market these days, I get dizzy looking at all of them! Thank you for another awesome recipe, I’m sure it will taste just as good as it looks. My favorite is a Hamilton Beach, it has a lid that locks down and is programmable. I will have to get the exact name/model for you. Oh thank you so much Christy, I really would appreciate the name/model! I really hate not having a slow cooker to rely on! We also live in Alabama, and we’re not used to this extreme cold! Our youngest son lives in Charleston, SC, and he is loving the snow they are getting today. I’m like you Christy, I’m not leaving my warm home unless I have to. I sure dread seeing this month’s electric bill! This recipe sounds good. What if you want to use wine instead of grape juice ? Yes, me too, I would use wine myself. I assume the equivalent of the grape juice but minus the vinegar? Oh goodness, you and me both!! I am allergic to mushrooms. What could I use in place of the cream of mushroom? Cream of celery soup! Easy to find and very versatile! It is cold in Iowa, is to get down to -14 tonight, was -19 2 nights ago, the heat in the apartment building where I live cannot keep up, my apartment is running 63 degrees and the heat is turned all the way up. I have on longjohns under my regular clothes and a blanket around me. Oh goodness, that is cold Beulah!! Please try to stay warm, hopefully this really cold snap will break soon! Thank you so much Peter, I am so glad to hear that you liked it!!! I hope you enjoy it Cindy, y’all stay warm up there!! Hi christy,,I’m sorry for your cold weather. I have to rub it in by telling you it is in the mid 70’s here in PHX,AZ.. I love all your recipes, thanks so much. Peggy! That is almost mean…LOL. Enjoy that sunshine for all of us over here freezing!! Let me know what you think Judi!! You’re a genius! Grape juice and vinegar? Genius. : ) This recipe sounds (and looks) fantastic! Next time I get me some manager’s special beef, guess what I’m going to be doing. : ) Thank you! It’s a nice toasty 5 degrees here tonight, and snow coming out our ears… a REAL winter! The kids are loving it! Y’all keep warm! Thank you Becky, I hope y’all stay warm and enjoy the snow!! Seriously? Using a Crook Pit and STILL using Cream of Mushroom soup? Pathetic. Ugh and grape juice instead wine? Please.stop. “UGH”! Blowing out somebody else’s candle does not make yours shine any brighter. 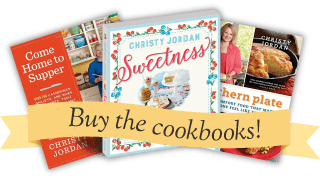 Do you peruse recipe sites, making ugly comments for fun? Sad life you must have. What a gracious response Renee! I was going to be much more unkind…something along the lines of I have a good idea of what the ‘a’ stands for…. This recipe sounds great Christy, can’t wait to try it! 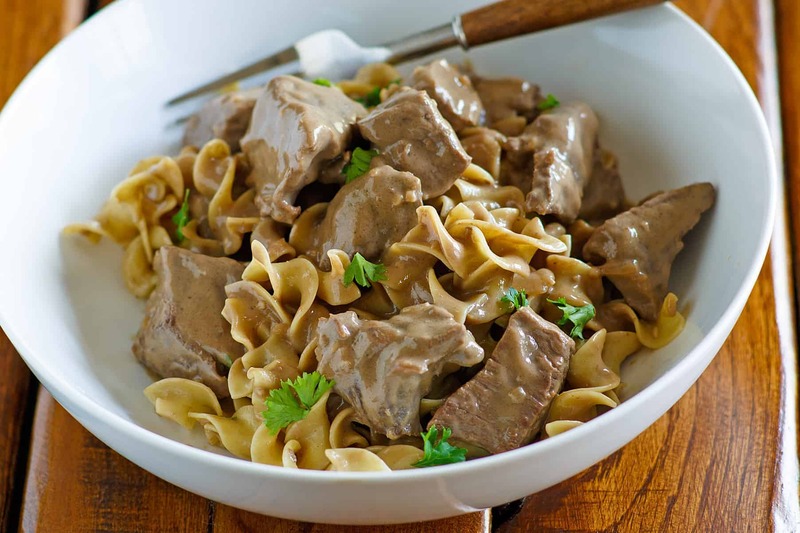 I had planned to make this with some frozen stew meat yesterday only to discover that I had used the stew meat for another recipe and forgotten! I DID have some pre-cooked frozen meatballs, so I used those instead and it was delicious! The hubby and all three kiddos asked to place it on our “repeat” list. Thank you for another wonderful recipe! Great quick thinking Susan!! Love that you were creative in figuring out a substitution and I am so glad it turned out great!! Thanks for giving it a try! Are you kidding me right now? I’d say you’re the pathetic one here…hello, don’t you have anything better to do than make sure we all know how you feel about this? Seriously ….what exactly is a CROOK PIT ? Lemme guess…did you fall in one? That’s why you’re so bitter,huh? What is a Crook Pit? I wonder if this could be done stovetop using hamburger meat? I’m anxious to try this but it’s too cold to go buy stew meat! I have never tried it that way but I would love to hear what you think if you give it a go!! Sounds great, this would be great any time. Blessings to you and yours. This sounds delish! Going to try it this week. I hope you enjoy it Renee!! Doesn’t the cooking process usually burn off the alcohol? Can one make food with wine or beer and the end product be safe for those that abstain from alcohol? The small amount usually used certainly wouldn’t get one drunk but is this more of a principle sort of thing? No, it does not burn it off. No matter how long it cooks there’s will still be a percentage of alcohol left. Christy is absolutely right. We have researched this. It sure does taste better with wine, but if you are serving kids or those who don’t use alcohol, you won’t want to take the chance. It may be a small but significant amount. No, no one will get drunk but that’s not the point. I am a teetotaller but I cook with wine having been told it is no longer alcoholic once brought to boiling temp and then simmered for a while. Won’t be doing this yum recipe for a while as it is 100 in the shade here in Australia. The alcohol does not go away, no matter how long it cooks but I know that is told a lot. I hope you get to make it, soon and that things cool down for y’all!! It’s cool to think of how easy it is to chat and we’re an ocean apart. I just read up on the using alcohol in recipes thing due to an alcoholic family member who has been sober for a while. I used a rehab site for info. The alcohol does not all cook out. There is still a good % left after cooking, even for long periods. Also, the site said that if the alcohol cooked completely out, the taste would be enough to set some people off the wagon. So, be cautious. I don’t have a problem cooking with it and eating the food. But, I’m not a drinker. That is correct, the alcohol does stay even with cooking. For no matter how long. Could you add the noodles to the crock pot at the end instead of cooking seperately? If so, how long should they cook? Christy I have not been able to print any of your recipes. When I hit print, I’m only getting a blank page. Hope you can help me with this issue. If you could give me as much information as possible, I might be able to figure something out. What device are you using? What internet browser? What is happening when you try to print? I would love to find the culprit but I’m afraid I can’t duplicate the problem on my end. Can’t wait to try this! You’re recipes are my favorites! Happy New Year!! This sounds good and easy! I found a recipe few years ago called Chicken Gloria. It called for Cream Sherry, I didn`t even know what that was! I googled and found out its a sweet sherry wine. I mixed grape juice and balsamic vinegar, a dab at a time until I thought it no longer tasted like grape juice, but it didn`t taste like balsamic vinegar either. That recipe has become one of my favorites! The mushroom and onion soup pot roast was always a family favorite growing up. I’ve made it many times. Adding “wine” never occurred to me. Just made this recipe today. It was amazing how much better it is with such a simple addition. Thank you! This is a keeper!!! Thanks Christy. In the crockpot now!! Looks yummy. 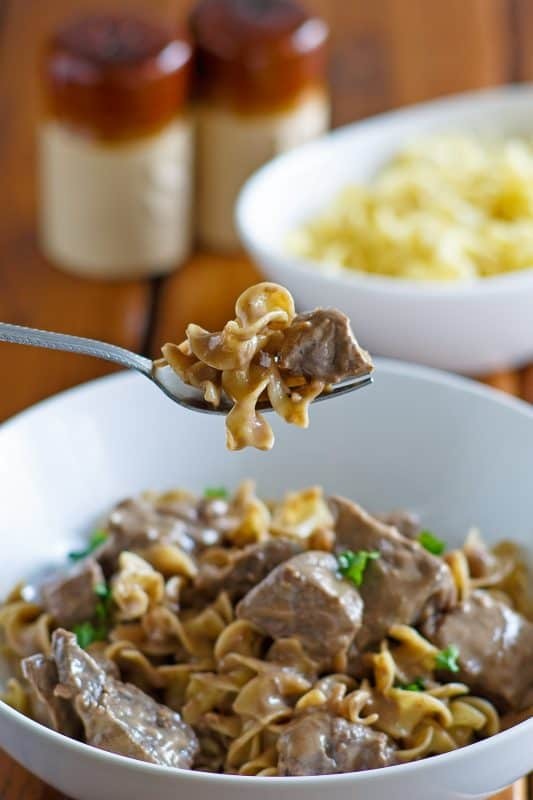 Christy, Just a hint but with a little sour cream you can change this recipe into a form of Beef Stroganoff. I do it that way and it’s soo yummy. I am not sure what the problem for you is Wyvona, I am not having any issues on my end at all. If you could give me as much information as possible, I might be able to figure something out. What device are you using? What internet browser? What is happening when you try to print? Sounds wonderful, How many does it serve?